So, What’s Everybody Doing for the Next Few Days? No texting on the sidelines, guys. Well, it appears there is an antidote to the vaunted blitzing Jets defense. It's that fad from last year, 2008's pet rock, the wildcat offense. Rex Ryan's defensive scheme is founded in pass rushers attacking the quarterback from all angles, catching him off guard. We learned last night, particularly in the fourth quarter, that the scheme doesn't work nearly as well when you're not sure who the quarterback is. Great football blogger Smart Football wrote about what the wildcat really is on the Times' Fifth Down blog yesterday, and why it's the furthest thing from a gimmick or a Johnny-come-lately strategy. And it certainly caused the Jets nothing but headaches last night. And it almost made Rex Ryan cry. The endlessly entertaining Jets coach takes pretty much everything he and his team do way too personally, and last night was no exception. "First off, it was a complete embarrassment by our defense," Ryan said. "I'll take full responsibility for that. I've never been in a game like that in my life." Anyone who has been a Jets fan their whole life has to be heartened by that statement. 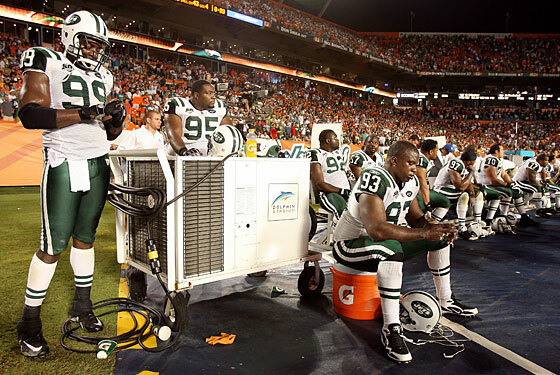 Maybe Rex Ryan has never seen a game like that, but Jets fans, man, they've seen far, far worse. If the wildcat is the Achilles heel of the Jets defense, they can take solace in the fact that they're unlikely to see much of the formation the rest of the year, at least until the Jets play the Dolphins again. And it's worth noting that the Jets still almost won this game, thanks in large part to Mark Sanchez — who shook off his wretched performance against the Saints last week and played outstandingly — and new wide receiver Braylon Edwards, who caught a touchdown pass and almost had another one. He's clearly the new shiny toy for the offense to play with, someone who stretches the field and changes the whole game. The Jets have lost two in a row, but it doesn't feel like they're reeling. It feels like they're just starting to figure all this out.